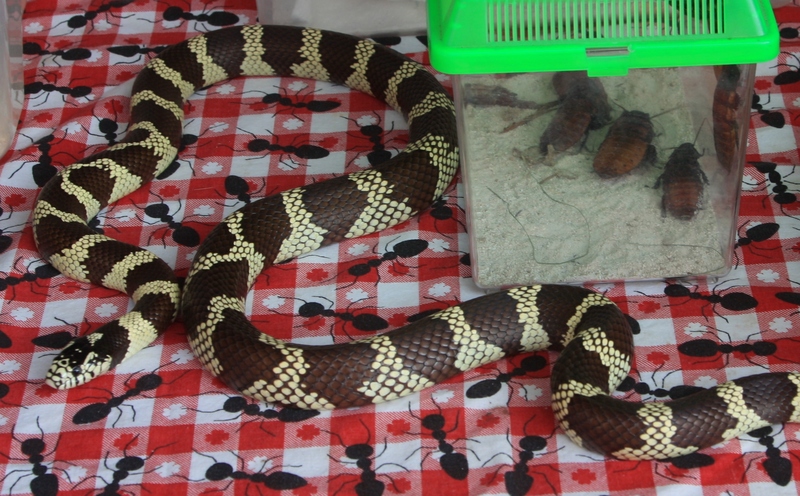 If you like exotic pets, you’ll love the critters that will be part of the Neighbor Appreciation Block Party at my White Lake (8020 Cooley Lake Rd.) Pet Supplies Plus store on June 20. Our block party will also feature special discounts (20% off everything in the store with the exception of clearance and sales items), free caricatures of pets and humans, free nail trims for pets and free hotdogs, popcorn, cotton candy and snow cones. So come out and join the party animals. 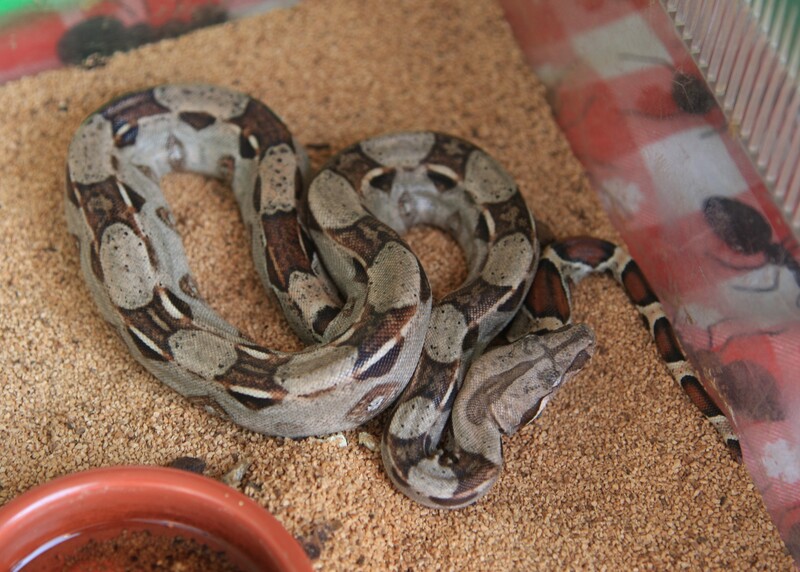 You might even get hissed at. For information on our Neighbor Appreciation Block Party – and on other upcoming events, go to www.petsuppliesplus.com/WHITELAKE13. Team member Chase Boothby serves hot dogs. Team member Catrina Batiu with Lucy Clucas of Turtle Creek Farm. They say winning’s all about the odds. Well, yours just got better. Come to my White Lake (8020 Cooley Lake Rd.) 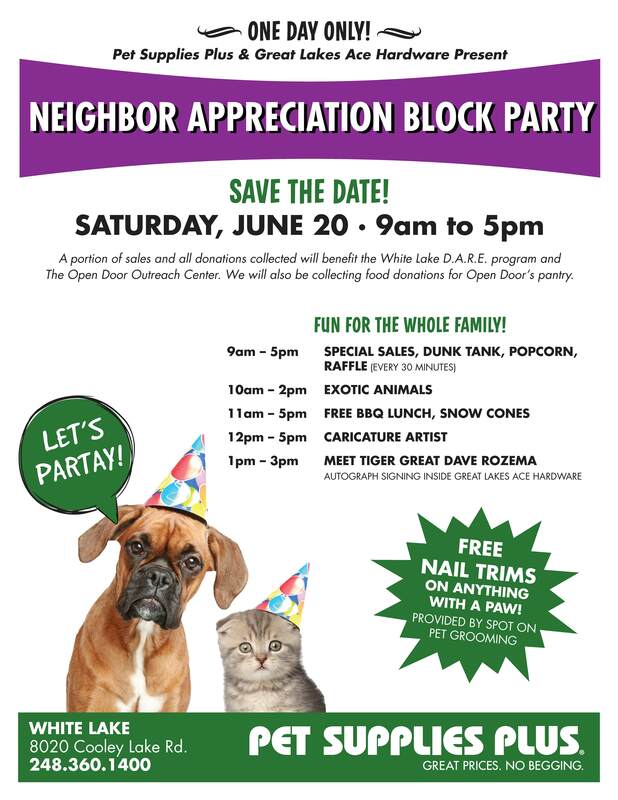 Pet Supplies Plus store on June 20 and you can take part in a raffle going on every 30 minutes as part of our Neighbor Appreciation Block Party. Raffles will be held from 9 a.m. to 5 p.m. and will feature lots of great prizes including two Weber grills, pet grooming and dog wash from Spot On Pet Grooming in White Lake, three months of dog or cat food, a doggie bed and more. Even if we don’t call your number, you’ll still be a winner following a day full of special discounts (20% off everything in the store with the exception of clearance and sales items), free caricatures of pets and humans, free nail trims for pets and free hotdogs, popcorn, cotton candy and snow cones. Who doesn’t love barbecued all-beef hot dogs, popcorn, snow cones and cotton candy? And when they’re FREE, it’s even better! Come to my White Lake (8020 Cooley Lake Rd. )Pet Supplies Plus store on June 20 and have lunch ON US from 11 a.m. to 5 p.m. as part of our Neighbor Appreciation Block Party. This is just one small way that we can show our appreciation to YOU – our loyal neighbors – for your continued business and support. We hope that you are finding all the food and supplies at our store that you to need to keep your pet healthy and happy. If you can’t find something that you’re looking for, always let the store manager know. We also place special orders. So join us on June 20. Bring your family and friends. The hot dogs will be hot off the grill. 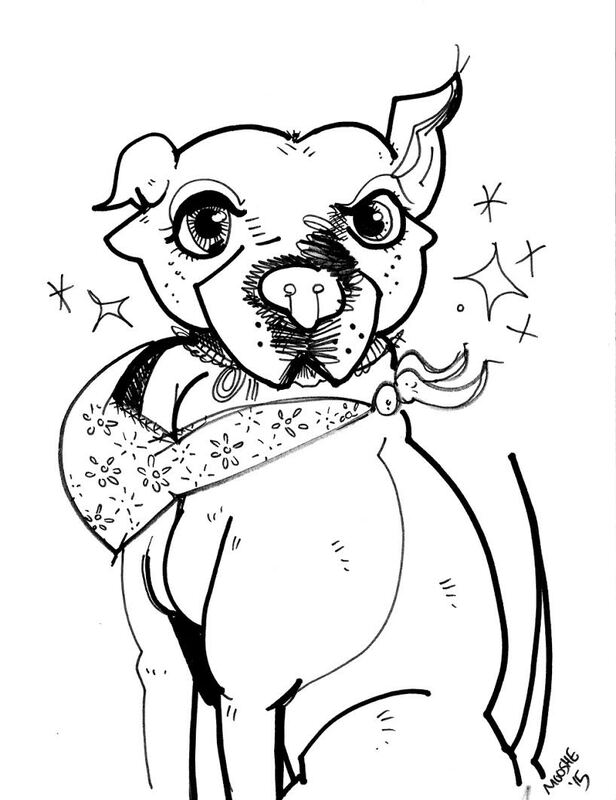 We’re also going to have a caricature artist, free nail trims for pets, a raffle very 30 minutes and 20% off everything in the store (excludes clearance and sale items). 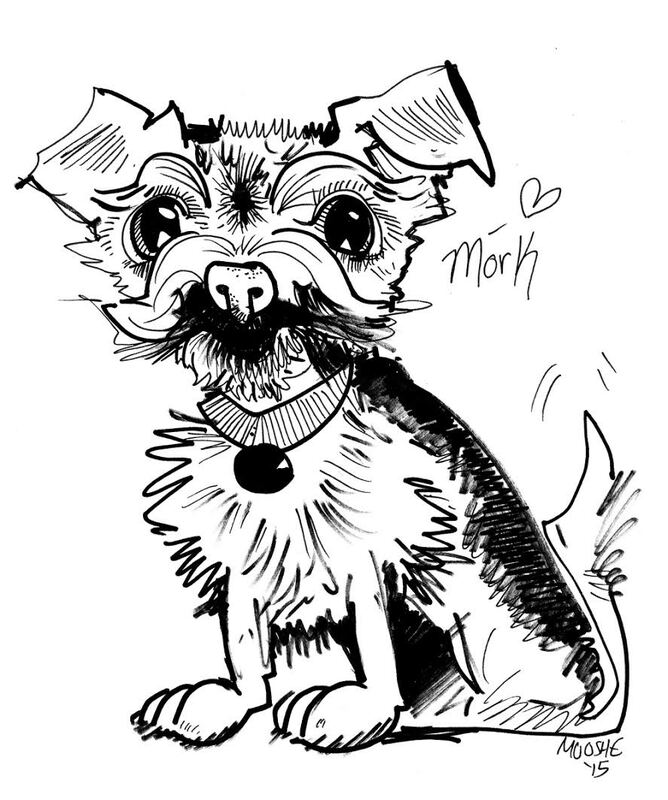 Another idea: Bring a friend or family member’s pet to get a caricature of them as gift. 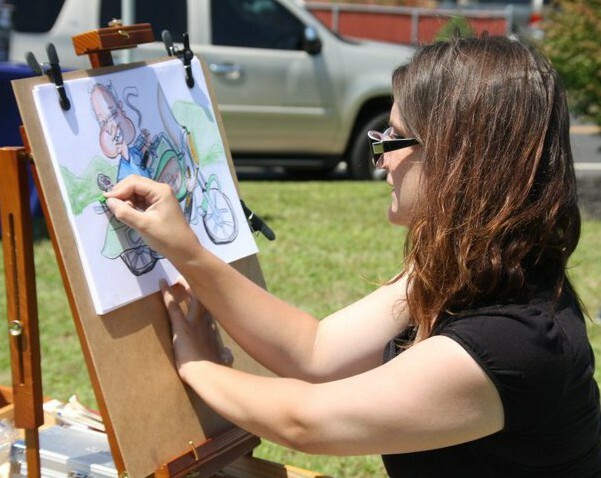 For information on caricature artist Mooshe Nickerson, go to www.CAREcatures.com. See adoptable cats in our Kitty City free-roaming adoption centers in White Lake (Highland Rd.) and Bloomfield Hills at https://www.facebook.com/pspkittycity.